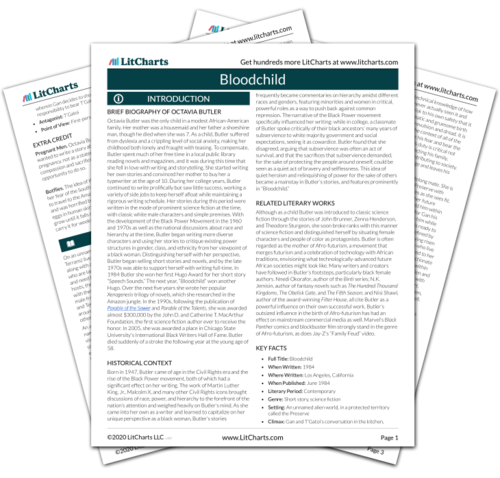 Instant downloads of all 945 LitChart PDFs (including Bloodchild). 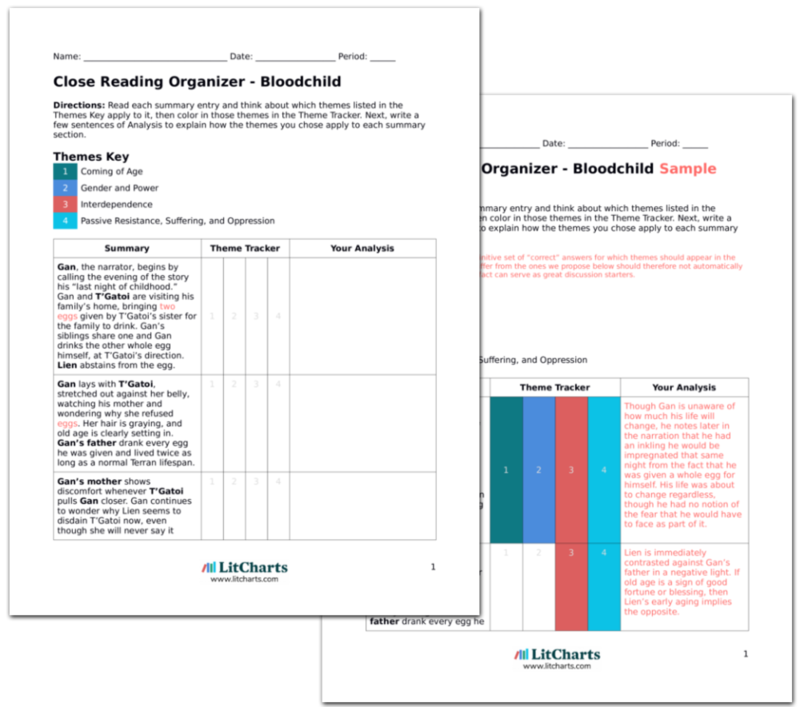 Welcome to the LitCharts study guide on Octavia Butler's Bloodchild. Created by the original team behind SparkNotes, LitCharts are the world's best literature guides. A concise biography of Octavia Butler plus historical and literary context for Bloodchild. A quick-reference summary: Bloodchild on a single page. In-depth summary and analysis of every of Bloodchild. Visual theme-tracking, too. Explanations, analysis, and visualizations of Bloodchild's themes. Bloodchild's important quotes, sortable by theme, character, or . Description, analysis, and timelines for Bloodchild's characters. Description, analysis, and timelines for Bloodchild's terms. Explanations of Bloodchild's symbols, and tracking of where they appear. An interactive data visualization of Bloodchild's plot and themes. Octavia Butler was the only child in a modest African-American family. Her mother was a housemaid and her father a shoeshine man, though he died when she was 7. As a child, Butler suffered from dyslexia and a crippling level of social anxiety, making her childhood both lonely and fraught with teasing. To compensate, Butler spent much of her free time in a local public library reading novels and magazines, and it was during this time that she fell in love with writing and storytelling. She started writing her own stories and convinced her mother to buy her a typewriter at the age of 10. During her college years, Butler continued to write prolifically but saw little success, working a variety of side jobs to keep herself afloat while maintaining a rigorous writing schedule. Her stories during this period were written in the mode of prominent science fiction at the time, with classic white male characters and simple premises. With the development of the Black Power Movement in the 1960 and 1970s as well as the national discussions about race and hierarchy at the time, Butler began writing more diverse characters and using her stories to critique existing power structures in gender, class, and ethnicity from her viewpoint of a black woman. Distinguishing herself with her perspective, Butler began selling short stories and novels, and by the late 1970s was able to support herself with writing full-time. In 1984 Butler she won her first Hugo Award for her short story “Speech Sounds.” The next year, “Bloodchild” won another Hugo. Over the next five years she wrote her popular Xenogenesis trilogy of novels, which she researched in the Amazon jungle. In the 1990s, following the publication of Parable of the Sower and Parable of the Talents, she was awarded almost $300,000 by the John D. and Catherine T. MacArthur Foundation, the first science fiction author ever to receive the honor. In 2005, she was awarded a place in Chicago State University's International Black Writers Hall of Fame. Butler died suddenly of a stroke the following year at the young age of 58. 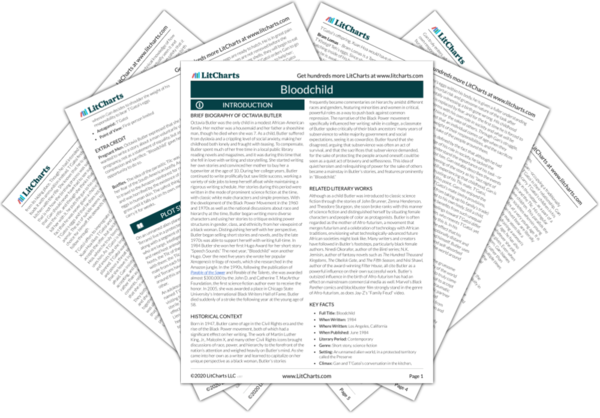 Get the entire Bloodchild LitChart as a printable PDF. Although as a child Butler was introduced to classic science fiction through the stories of John Brunner, Zenna Henderson, and Theodore Sturgeon, she soon broke ranks with this manner of science fiction and distinguished herself by situating female characters and people of color as protagonists. Butler is often regarded as the mother of Afro-futurism, a movement that merges futurism and a celebration of technology with African traditions, envisioning what technologically-advanced future African societies might look like. Many writers and creators have followed in Butler’s footsteps, particularly black female authors. Nnedi Okorafor, author of the Binti series; N.K. Jemisin, author of fantasy novels such as The Hundred Thousand Kingdoms, The Obelisk Gate, and The Fifth Season; and Nisi Shawl, author of the award-winning Filter House, all cite Butler as a powerful influence on their own successful work. Butler’s outsized influence in the birth of Afro-futurism has had an effect on mainstream commercial media as well. Marvel’s Black Panther comics and blockbuster film strongly stand in the genre of Afro-futurism, as does Jay-Z’s “Family Feud” video. Pregnant Men. Octavia Butler expressed that she had always wanted to write a story about a man voluntarily undergoing pregnancy, not as a statement of equality, but as an act of compassion and sacrifice. “Bloodchild” gave her the opportunity to do so. Botflies. The idea of the parasitic Tlic was initially born out of her fear of the South American botfly. As Butler was preparing to travel to the Amazon rainforest for research, she read about, and was horrified by, the existence of a parasitic fly that lays eggs in human skin. The safest thing to do is to let the larva grow until it falls out on its own, meaning the host will have to carry it for weeks. Homstad, Levi. "Bloodchild." LitCharts. LitCharts LLC, 28 Mar 2019. Web. 23 Apr 2019. Homstad, Levi. "Bloodchild." LitCharts LLC, March 28, 2019. Retrieved April 23, 2019. https://www.litcharts.com/lit/bloodchild.